As the deep freeze and, in some cases, snow settles into the Midwest, winter birding is alive and well. This winter appears to have brought us an increase in some colorful and beefy-looking grosbeaks. Last fall, Ron Pittaway’s Winter Finch Forecast suggested we would see some good flights of these birds. 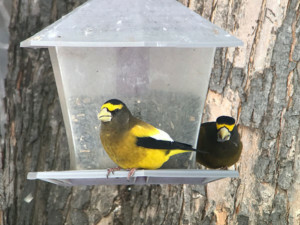 The eastern United States had quite the influx of evening grosbeaks in the early winter, some finding their way as far south as Indiana and Illinois. Pine grosbeaks are making their mark in the northern states in very large numbers. Evening grosbeaks resemble a goldfinch on steroids with a massive bill. Males are a combination of yellow, black, and white with a prominent unibrow. Females are grayer overall with bold black and white wing patches. These birds have an interesting diet. They are definitely attracted to black-oil sunflower seeds and will empty a feeding station quickly when they show up in large flocks. In the wild, they use that large bill to crack open hard deciduous and conifers seeds. Grosbeaks also will snip the end of maple twigs to eat flowing sap. When those are not as abundant in Canada, they tend to dip into the United States. Outside of winter, they eat quite a few insects, and it’s believed that spruce budworm led to larger numbers of these birds in the United States in the last century. They’ve also been observed feeding on road salt and ash from fire pits. Pine grosbeaks have a pretty tinkling sound. 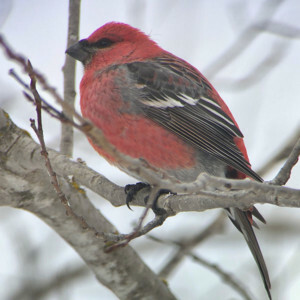 Pine grosbeak males are a bright pink with varying patches of soft gray. Females can be yellowish to an almost russet color with gray plumage mixed in. This bird is also about the size of a cardinal and they have little fear of humans when at a feeding station. Like most feeder birds, they also chow down on black-oil sunflower seeds. Pine grosbeaks are a bit more vegetarian than evening grosbeaks. 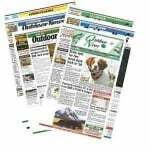 They will feed their young insects and spiders, but usually demand vegetable matter as adults including ash, box elder, willow, and birch seeds and buds. If you haven’t seen either of these birds at your feeders yet, you may see them later in winter as they travel to look for more tree seed crops. There’s also a bit of a second migration for winter finches that occurs this time of year. You can also look to see where these birds are being reported in eBird and make a road trip. They are fun target birds while we wait for spring migration to get back underway. For those who want a crazy big adventure, you can always join the Sax Zim Bog Birding Festival http://www.saxzimbirdingfestival.com/ in Meadowlands, Minn., to brag to your friends how you visited a frozen bog for grosbeaks and boreal owl species. Don’t fret, most of the birding is by car.